In this first aid blog post we discuss two important heat related conditions – heat exhaustion and heat stroke. 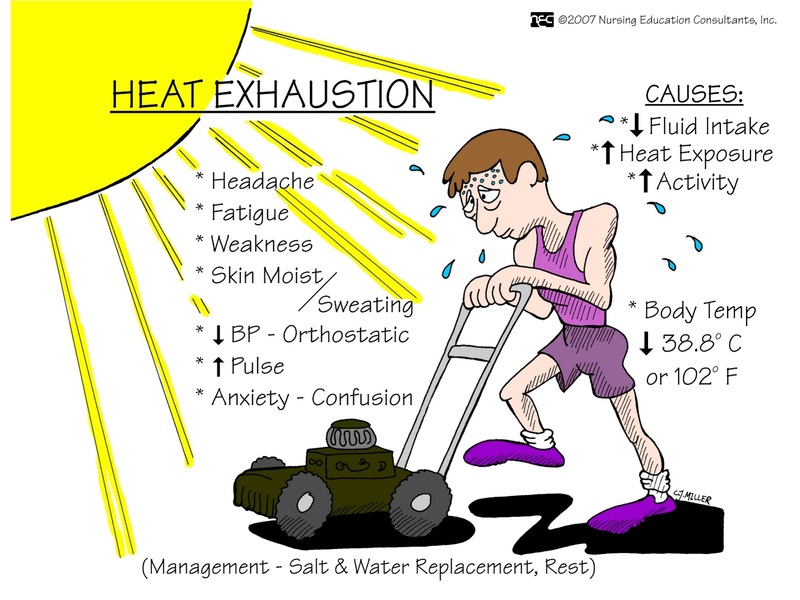 Heat exhaustion normally happens gradually. Working in high temperatures, medication and drugs (for example stimulants such as ecstasy) and lots of exercise can lead to overheating and dehydration. have a rapid weak pulse (as the body tries to get rid of heat). The treatment is to sit them in the shade, away from the heat. Give the patient fluid to drink, preferably something with some salt in it like rehydration salts or isotonic drinks. Remember to monitor baseline observations (pulse, respiratory rate, temperature etc) and if they don’t get back to normal, send the patient to a healthcare professional for further assessment. Heat stroke happens when the temperature control centre in the brain (the hypothalamus) stops working prope rly, and the body doesn’t realise the rise in temperature. It can be caused by illness, drugs (like ecstasy) or by under-treated heat exhaustion. It is life threatening and can cause unconsciousness very quickly. 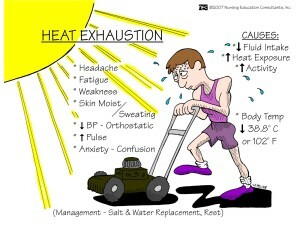 The symptoms are similar to heat exhaustion and it can be difficult to tell the two apart. 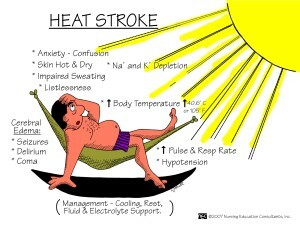 In heatstroke, patients have stopped sweating so they have hot, flushed, and dry skin. They’re so warm that they are often restless, confused or have a reduced level of consciousness. Quick treatment is vital. Move the casualty to a cool place and cool them down. Wrap them in a cold wet sheet. Keep the sheet wet by constantly pouring water over it. If there is no sheet available, fan or sponge them. Monitor observations, and seek urgent medical assistance.